In the bowl of your stand mixer combine butter and sugar until fluffy. Once fluffy mix in eggs one at a time. In a separate bowl sift together flour, baking powder and salt. With the mixer on low add in 1/3 of the flour mixture, 1/8 cup of coffee, another 1/3 of the flour mixture, the rest of the coffee, and the rest of the flour mixture. Don't over mix, mix until just combined. Fill 12 cupcake liners 2/3 of the way full with the batter. Bake for approximately 20 minutes or until cake springs back when touched. 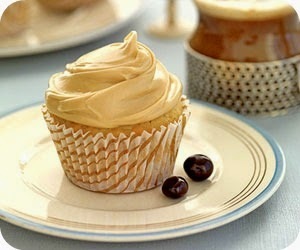 For the frosting; In a large bowl cream together butter, cream cheese, vanilla and coffee extract. Once combined slowly mix in sifted powdered sugar. Mix until frosting is light and fluffy.